In 2012, after much research, I proposed that Rivendell Academy have an official school Facebook page to promote student learning, inform parents and community of school events, and provide overall greater access to the wonderful things happening in the land of the Raptors. Since then our Facebook page has hundreds of followers, each post garners over 300 views, and the public is able to see, especially through video, what we do here. This is one of the best ways that a school can promote itself. EDU2.0 is a free online interactive learning platform where schools and teachers can host all of their classes, gradebooks, curriculum, calendars, attendance, and so for. Over the past 5 years, I’ve hosted all of my classes on EDU. Students are able to access all course materials and participate in online discussion forums about nightly readings and videos. Completing reading responses in this format has changed the concept of “homework” in my classes. Students have to read, write a response, read responses of their classmates, and respond to at least one other classmate. Before class, I read all of the responses and then frame the class discussion based on their thinking. Many students felt awkward at first making their their work public to their classmates but over time they got used to it and really appreciated learning from each other. Not all students like or feel comfortable participating in class discussions so their voices weren’t always heard. Through posting online, all student voices are heard. This year we are changing from EDU2.0 to a Moodle Platform that does a better job of hosting all of our courses and curriculum documents. While EDU2.0 is a great platform, Moodle is supposed to be even better. All teachers will have to have course sites with course resources for students and detailed curriculum documents. Many teachers will continue to use online discussion forums, quizzes, small group collaborative work spaces, and so forth. This really makes sense for us because we have a 1:1 laptop program and students can access all of their course materials from anywhere with an internet connection. Students also need the opportunity to practice and get familiar with working in online discussion forums and other digital collaborative spaces before heading off to college or the workplace. In addition to Moodle, all students and teachers have school Google accounts where they organize, share, and store their work in the cloud. Many teachers have students share work, provide comments/feedback, and accept digital assignments. Students use Google docs to collaborate on group assignments from where ever they are and teachers share and collaborate on curriculum development and other school initiatives. This has provided greater access to a variety of materials and has cut down on the amount of paper and copying that happens. Students need to know how to use Google drive before leaving high school. 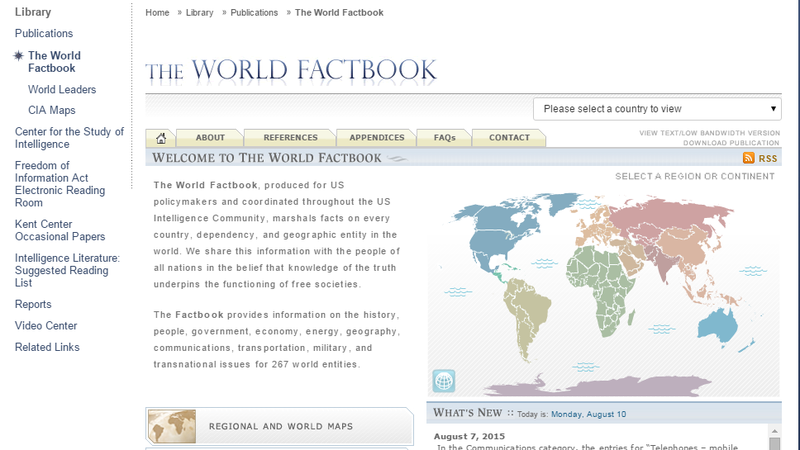 Published by the CIA, the World Factbook is an incredible resource of information about every country in the world. From historical summaries, to government structure, demographics, economy, etc. this is a very useful resource bank of facts for any global education teacher.